Slit lamps. Docs need them, patients need them, industry experts need them. Whatever the reason for needing a slit lamp is, we can all agree…we need them. When it comes to purchasing a slit lamp, there are five important factors that should always be considered – illumination, magnification power, slit width/length, filter capabilities and the light source. Whether you’re in the market for a new one or upgrading from an older model, these five categories should be considered carefully during your research. Not all slit lamps offer just one equipment feature that performs every observation, so it’s essential to review their functions carefully before making a purchase. Slit lamps come in one of two illumination types – the tower illumination type (a.k.a “Haag Streit”) and the integrated illumination type (a.k.a “Zeiss”). What’s the difference? The Haag Streit style provides the light source from the top of the instrument, while the Zeiss style supplies the light source from the base. When it comes to which is best for a practice, it is ultimately a practitioner’s preference as to which is illumination type is needed. There are a number of illumination techniques that are used during a typical examination; i.e. retro, diffuse/direct, focal broad beam, focal slit illumination, specular reflection, and sclerotic scatter, to name a few, all allowing the examiner to view the various structures and tissue of the eye correctly. The higher magnification power, the better! At least 20x is required on most slit lamps; however, obtaining a slit lamp with 40x magnification is best for performing a more thorough examination. It is ideal to begin the exam with a larger field of view and gradually increase the magnification power for areas of particular interest. This is the adjustment feature of the slit (light). Similar to the magnification power, the slit length/width should be adjustable the use different methods of observation. Van Herick’s technique requires a 60° slit and 6x-10x magnification into the limbus in order to measure the angle of the anterior chamber, while a 45°-60° angle and 16x-20x magnification is needed to perform either the conical beam or corneal cross-section techniques. Depending on the exams your practice is performing, you will want to understand the width/length features of your slit lamp. 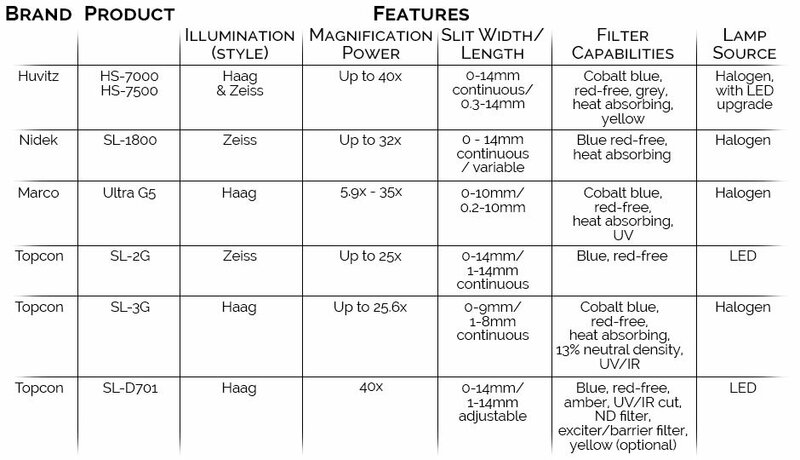 Most slit lamps offer cobalt blue, red free, neutral density, heat absorbing, grey, yellow filter and/or diffuser. Whether you are assessing the tear film quality and break up (cobalt blue), or differentiating pigment lesions from blood vessels in the retina (red free), you should be sure to fully review the filter capabilities of the slit lamp you are purchasing to find the one that best fits the needs of your practice. Refer to the comparison chart on the next page for more information. There are many other characteristics that are important to professionals in the field, but light source seems to be a hot topic for many. Most modern slit lamps offer a halogen or LED source option for illumination. LED bulbs last considerably longer and many examiners feel these offer a “cooler” light which makes viewing the retina easier, as they do not emit heat like halogens can, making them more comfortable for the patient. There are a variety of slit lamps on the market today that offer these features, with some offering more than others, but let us be sure to compare apples to apples. Here is a brief look at the top slit lamp manufacturers and how they compare to each other, on the above mentioned features. As you can see, there are an assortment of different features and levels of performance when it comes to slit lamps, so the best thing to be is educated. Learn what you need, learn what is offered, and make the best decision for your practice.